Slowly he felt his muscles loosen and he tried opening his eyes again. This time it worked, but he had to close them just after he managed the deed. The sun was shining brightly down on him and not just obscured his vision, but also hurt eyes. He opened them again, but this time only a slit wide and this way he was able to see some of his surroundings regardless of the light. The sky above him was blue and clear, aside from a few faint clouds. What he could see from his surroundings, without moving his head, was empty greenery and seemed peaceful enough. He closed is eyes again and relaxed so that the rest of his body would wake as well. It felt like hours until he could finally move his hands and feet. For a moment he just opened and closed his fists and wiggled his toes to pump blood through his veins. A little longer and he could finally sit up and take look around. In front of him was a river that slowly made its way through a valley. Behind it and behind him, from what he could see without turning completely around, was a forest, with a few high trees standing sentinel amongst them. More than once he tried standing up, only to fall back on his behind again. After the umpteenth time he stood, swaying a bit, but still staying upright. Startled by a whinny he turned to see a fully saddled horse, gnawing at the grass behind him. Even if he didn’t knew anything about his whereabouts, he knew that this horse was his. Tenderly he stroked the nostrils of the stallion when it lifted its head in greeting. „Where are we old friend?“ He asked it in a hoarse whisper. But the only reply he got was another whinny when the horse moved his head up and down. Resigned he turned around again to find his bearing. After a moment he realized that the river reminded him of an old brook that he used to pass on his way from his families castle to the neighbouring shire. If it was indeed the same brook, he wondered, maybe it had rained and filled up to look like a river, but then he should have been drenched and his clothes were as dry as they could be. Still, it was the only clue he had and he wanted to follow on it. He turned to his horse and mounted it, leading it into the direction he thought his fathers castle to be. It took him a couple of hours to reach his destination. The forest and plains he passed on his way displayed the beauty of spring all around him. He had seen some patches of snow that still told the story of winter, but he also found the first blossoms of new life. By now he thought the brook had enlarged due to the snowmelt further down the stream. The sun that shone so brightly when he had awoken, was now slowly sinking behind him, starting to paint the world in its red and orange light. One last hill lay before him and afterwards he would be able to see the castle from afar. But when he reached the top he dismounted and sank to his knees in disbelief. Where his castle, his home, should have been, was only a ruin. It couldn’t be, it was impossible, that could not be his home, he thought. The horse beside him neighed and jolted him out of his trance. With determination in his heart he raised and ran towards the ruin to prove to himself that this was not what he was looking for; his horse forgotten behind him. He ran as fast as his legs would carry him, stumbling over his own feet and greenery every few steps. His breath was ragged and his limbs felt sour, when he finally came to a halt beneath an old and rusted iron gate. Heavily panting he bent down, his hands on his knees to catch his breath. One last time he braced himself for his possible discovery then he straightened up again to take a closer look at what was in front of him. And the breath, he had so vigorously collected got stuck in his throat and his heart seemingly stopped. There, sculpted on the gate, was the rose sigil of his house, covered by a few flakes that remained on top of the delicate flower. It was impossible, how could this have happened? He asked himself as he reached for the rose with a trembling hand. The greenish iron was cold to his touch, but there was no mistaking it, for what it was. Tears filled his eyes and dread his heart as the realization came to him: His family was gone. While his fingertips still rested on the sculpture a light erupted from between the dark pedals in waves like the pulsing of a heartbeat. It became brighter and larger with each beat until it enclosed him completely. An here it is, the first story in English [Edit 26.02.: – now also with a German version]. This time the picture, which is another remnant of my Advent Calendar, though this time from Annett – aka Anice, if you’re following my Blog -, is not the only source of inspiration. Additionally the story is also based on Schandmaul’s Reich der Träume (Realm of Dreams), still, it only displays a small part of the song’s story, which means that there definitely will be continuations. If they will be in English, part of this project or independent from it, that I do not know yet. In any case am I glad, that I got the permission by one of the Schandmäuler to try to write down the stories of their songs. So Thanks to Annett for the picture and to Schandmaul for the permission! The rights for the story are mine, the ones for the pictures belong to Annett Prodöhl, the ones for the elements of the song belong the Schandmaul. Neither is to be used or copied without consent of either party. Seine Sinne kehrten langsam zu ihm zurück, je mehr er erwachte. Er konnte die Wärme der Sonne, die ihm an einem neuen Tag begrüßte, auf seiner Haut spüren. Ein tiefes Brummen verließ seine Kehle als er versuchte seine Augen zu öffnen und versagte. Er fühlte die Müdigkeit in seinen Knochen und es war, als ob sein Körper noch nicht realisiert hatte, dass sein Verstand erwacht war und sich weigerte ihm Folge zu leisten. Jede Faser seines Körpers fühlte sich taub an, seine Gedanken rasten jedoch. Er versuchte sich zu erinnern wo er war und was passiert war, er hatte jedoch keine Erinnerung daran wie er hierhergekommen war, wo immer es auch war wo er gerade lag. In der Ferne konnte er Vogelgezwitscher hören und dicht neben sich hörte er das Fließen von Wasser, unter sich fühlte er weiches Gras und das verriet ihm zumindest etwas über seine Umgebung, dennoch viel zu wenig für seinen Geschmack. Nach einer Weile fühlte er, wie seine Muskeln anfingen sich zu lösen und er versuchte erneut seine Augen zu öffnen. Dieses Mal klappte es, aber er musste sie sogleich wieder schließen. Die Sonne schien hell auf ihn herab und blendete ihn schmerzhaft. Er öffnete sie erneut, diesmal aber nur einen Spaltbreit und so war er in der Lage trotz des Lichtes mehr von seiner Umgebung zu sehen. Über ihm war der Himmel abgesehen von ein paar blassen Wolken, blau und klar. Das was er von seiner Umgebung sehen konnte, ohne dass er seinen Kopf bewegen musste, waren leere Grünflächen und es schien friedlich genug zu sein. Er schloss seine Augen erneut und entspannte sich damit der Rest seines Körpers ebenfalls erwachen konnte. Es kam ihm wie Stunden vor, bis er endlich seine Hände und Füße bewegen konnte. Einen Moment lang öffnete und schloss er lediglich seine Fäuste und wackelte mit den Zehen, um das Blut durch seine Venen zu pumpen. Noch einen Moment später und er konnte sich endlich aufsetzen und sich umsehen. Vor ihm war ein Fluss der langsam seinem Weg durch ein Tal folgte. Dahinter und hinter ihm, soweit er sehen konnte ohne sich komplett umzudrehen, befand sich ein Wald inmitten der Bäume gelegentlich ein hohes Exemplar, das Wache stand über das Gebiet. Mehr als einmal versuchte er aufzustehen, nur um wieder auf seinem Gesäß zu landen. Nach wiederholtem Versuch stand er, er schwankte ein wenig, aber er blieb stehen. Aufgeschreckt durch ein Wiehern drehte er sich um und entdeckte ein vollständig gesatteltes Pferd, dass genüsslich am Gras hinter ihm knabberte. Selbst wenn er nicht wusste, wo er sich befand, so wusste er doch, dass dieses Pferd seines war. Zärtlich streichelte er die Nüstern des Hengstes, als dieser ihm den Kopf zur Begrüßung entgegenstreckte. „Wo sind wir alter Freund?“ Fragte er mit einem heiseren Flüstern. Aber die einzige Antwort, die er erhielt war ein weiteres Wiehern als das Pferd seinen Kopf auf und ab bewegte. Resigniert drehte er sich wieder um und versuchte sich zu orientieren. Nach einer Weile bemerkte er, dass ihn der Fluss an einen alten Bach erinnerte, an dem er immer auf seinem Weg vom Schloss seiner Familie zur benachbarten Grafschaft vorbei kam. Wenn es wirklich derselbe Bach war, wunderte er sich, hatte es vielleicht geregnet und er hatte sich gefüllt und sah nun aus wie ein Fluss, aber dann hätte er auch durchnässt sein müssen und seine Kleidung war so trocken, wie sie nur sein konnte. Trotzdem, dies war der einzige Hinweis den er hatte und er wollte ihm folgen. Er drehte sich erneut zu seinem Pferd um, bestieg es und lenkte es in die Richtung in der er das Schloss seines Vaters vermutete. Er brauchte ein paar Stunden um sein Ziel zu erreichen. Der Wald und die Felder an denen er vorbeiritt erstrahlten schon in der Schönheit des Frühlings. Hin und wieder kam er an kleinen Schneehaufen vorbei, die noch die Geschichte des Winters erzählten, aber er fand auch schon Blüten, die neues Leben verkündeten. Mittlerweile dachte er, dass der Bach sich auf Grund der Schneeschmelze Stromaufwärts vergrößert hatte. Die Sonne, die so stark geschienen hatte, als er aufgewacht war, ging nun langsam hinter ihm unter und fing an die Welt in ihr rotes und orangenes Licht zu tauchen. Ein letzter Hügel lag vor ihm, dann würde er das Schloss schon aus der Ferne sehen können. Aber als er oben ankam, stieg er von seinem Pferd und sank auf seine Knie in Unglauben. Dort, wo das Schloss, sein Zuhause, sein sollte, stand nur eine Ruine. Es konnte nicht sein, es war unmöglich, das konnte nicht sein Zuhause sein, dachte er sich. Das Pferd neben ihm wieherte und riss ihn aus seiner Trance. Mit Entschlossenheit in seinem Herzen stand er wieder auf und rannte in Richtung der Ruine um sich selbst zu beweisen, dass sie nicht das war, wonach er suchte; sein Pferd hinter ihm vergessen. Er rannte so schnell seine Beine ihn tragen wollten, stolperte alle paar Schritte über seine eigenen Füße und den grasigen Boden. Sein Atem ging abgehakt und seine Glieder schmerzend, als er endlich unter einem alten, rostigen Tor zum Stehen kam. Keuchend beugte er sich vor, seine Hände auf seine Knien gestützt, um Luft zu holen. Ein letztes Mal nahm er all seinen Mut zusammen für die mögliche Entdeckung, dann richtete er sich wieder auf um einen genaueren Blick auf das zu werfen, was vor ihm stand. Und der Atem, den er zuvor gesammelt hatte, blieb ihm nun im Halse stecken und sein Herz hörte scheinbar auf zu schlagen. 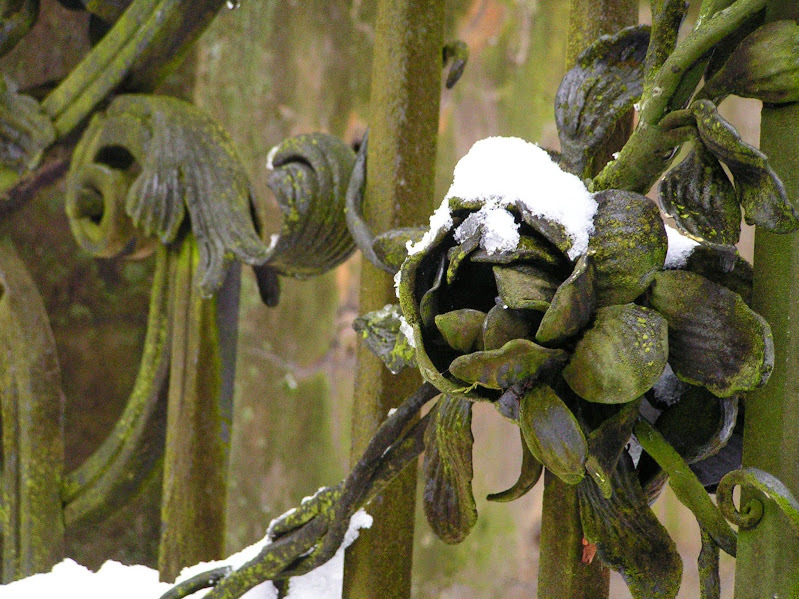 Dort, geformt als Teil des Tors, war das Emblem seines Hauses, bedeckt von ein paar verbleibenden Schneeflocken auf der zierlichen Blume. Es war unmöglich, wie konnte das passiert sein? Fragte er sich und streckte seine zitternde Hand nach der Rose aus. Das grünliche Eisen fühlte sich kalt an, aber es gab keinen Zweifel daran, was es war. Tränen füllte seine Augen und Verzweiflung sein Herz als er erkannte: Seine Familie war von ihm gegangen. Während seine Fingerspitzen noch immer auf der Skulptur ruhten strahlte ein Licht zwischen den dunklen Blütenblättern im Rhythmus eines Herzschlags hervor. Mit jedem Schlag wurde es immer heller und größer, bis es ihn schließlich komplett umschloss. Und da haben wir auch schon die erste Geschichte auf Englisch [Edit 26.02.: – jetzt auch mit Deutscher Fassung]. Dieses mal ist das Bild, das wieder mal ein Überbleibsel meines Adventskalenders ist, nur diesmal von Annett – aka Anice, für die, die meinem Blog folgen -, nicht die einzige Inspirationsquelle. Zusätzlich ist die Geschichte auch an Schandmaul’s Reich der Träume angelehnt, dennoch erzählt sie nur einen kleinen Teil der Geschichte des Liedes, d.h. es wird definitiv Fortsetzungen dieser Geschichte geben. Ob nun auf Englisch, im Rahmen des Projektes oder unhabhängig davon, dass weiß ich allerdings noch nicht. Auf alle Fälle bin ich froh, dass ich von einem der Schandmäuler letztes Jahr die Erlaubnis bekommen habe, mich daran zu versuchen, die Geschichten ihrer Lieder aufzuschreiben. Also Danke an Annett für das Bild und an Schandmaul für die Erlaubnis! Die Rechte des Bildes liegen bei Annett Prodöhl, die der verwendeten Elemente des Liedes bei Schandmaul und die der Geschichte bei mir. Eine Nutzung oder Weitergabe ist ohne unsere jeweilige Genehmigung nicht erlaubt. Kann man das auch irgendwo als deutsche Übersetzung lesen? Sooo weit reichen meine längst verschütteten Englischkenntnisse nämlich nicht mehr…..
Momentan gibt es noch keine Übersetzung, aber wenn ich es schaffe, kann ich die Übersetzung die Tage noch reinstellen. Wäre dann auch hier in dem Beitrag. gute Nachrichten: Die Übersetzung ist jetzt vorhanden!